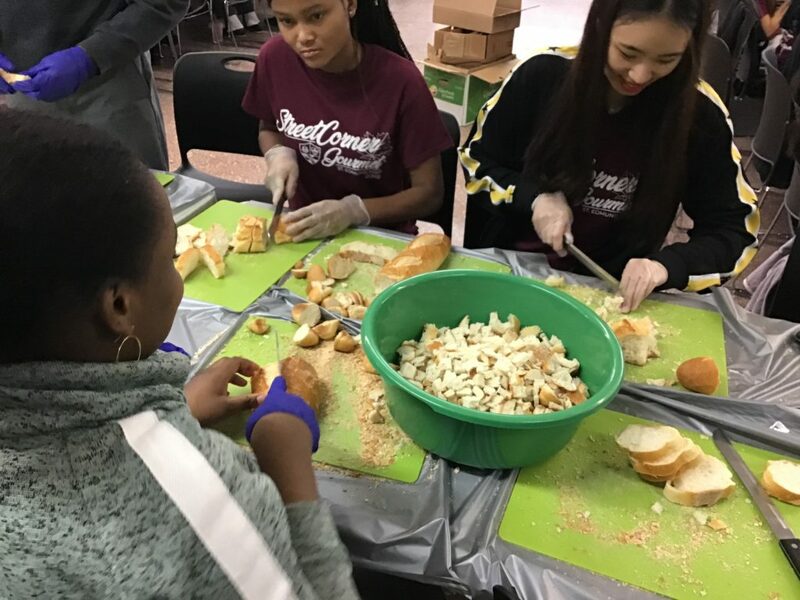 Once again this year, a large group of SJHS students participated in the annual Thanksgiving-On-The-Street, founded by Sister Mary Lanning of Yes!Solutions. 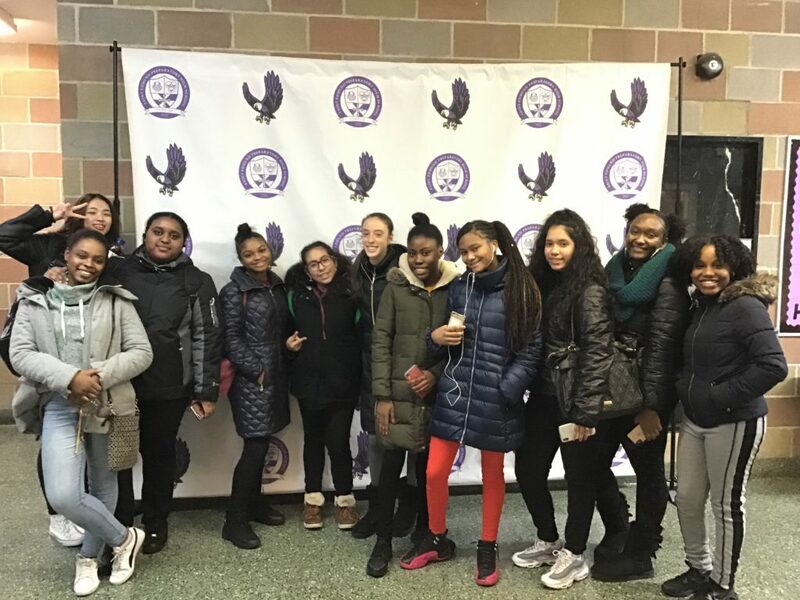 One of the many “neighbor-to-neighbor” initiatives of Yes!Solutions, the annual Thanksgiving feast serves upwards of 2000 New Yorkers from a bench in a bus stop in Harlem. You can imagine that such an enormous meal requires many chefs – and indeed, schools, churches and homes from across the city participate in contributing different components of the meal through the Street-Corner Gourmet program. 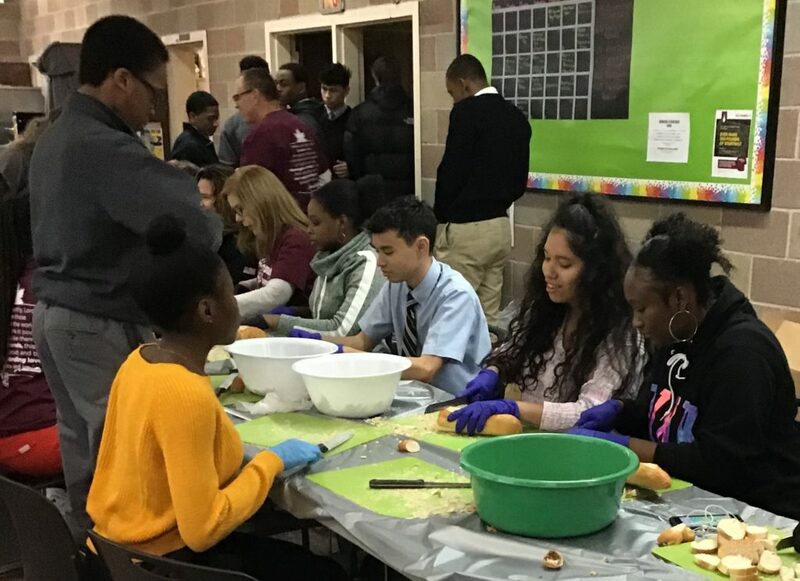 At St. Edmund’s Prep in Sheepshead Bay, St. Joseph High School students joined others in preparing the delicious Stuffing From Heaven using a special recipe. They chopped up mountains of bread, herbs, nuts and veggies, getting their Thanksgiving off to a tasty start. Street-Corner Gourmet was, to say the least, an extraordinary experience. I had a lot of time to reflect on my life and be thankful for what God has blessed me and my family with. It was an eye-opener for me and I’m so happy I had the opportunity to partake in such an amazing charity event. I believe that it is our duty as humans to help one another whenever we can. Doing small things in life like cutting bread or baking cookies to give to those who are hungry makes a great change in the world. Community service brings everyone together; it is an action that unites many for a greater good. It was a really long but happy day and I’m never going to forget it as it brought so much joy to me. I’ve always wanted to help cook food for homeless people or give it out to them, and I felt extremely happy to do so. I would have rather do community service and help others than go home and waste time doing nothing. Me and a couple of the girls broke bread, cracked nuts, and cut celery, and spent a little time on the seasonings. We were all talking and laughing with the other kids there. I loved the fact that I was doing something productive; instead of being on the streets, being with friends outside, watching tv and other things that are a waste of time, I was doing something for a genuine purpose.